All standard 2009 V6 and GT Mustangs have 45th Anniversary fender badges making them essentially all Anniversary models. 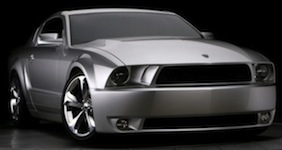 There is although a series of aftermarket customized coupes by California Galpin Ford, some prominent designers and metal fabricators, and Lee Iacocca called the Lee Iacocca Silver 45th Anniversary Edition Ford Mustang. Introduced in late July of 2009 they have customized sunken headlights, custom grille, a regular or supercharged 4.6L V8, custom wheels, Ford Racing suspension, custom interior, and unique silver paint. 45 cars were customized this way.